Where in the World is Martin Sheen? Martin and son Emilio crossed the country in the fall of 2010 to promote their film "The Way". I attended an advance screening in Chicago in August, 2011, and loved the movie. It is a "must see" for every fan. "The Way" will be available on DVD on February 21st for those who missed it in theaters, or for those who just want to be able to see it again and again. Martin Sheen Gallery - A portrait gallery in slideshow format plus personal albums, including lifestyle photos, red carpet pics, candids and golf. Also included is a Sheen/Estevez family album. The Actor's Gallery - A filmography in pictures, with images from over 100 of Sheen's film and television roles. "West Wing" Gallery - Martin Sheen as President Jed Bartlet, with scenes from the acclaimed television drama The West Wing and an extensive character gallery. Also included are behind the scenes photos and articles. Activism - Martin works as a tireless activist for peace and social justice - view commentary, images and links. The Library - articles, commentary and interviews. 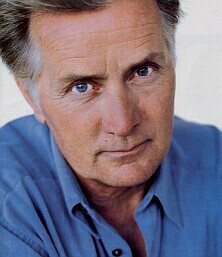 More about Martin Sheen and "The West Wing"
Suggestions or contributions? Contact the WebDesigner. Comments? Please sign The Guestbook. This is an unofficial website and it is not endorsed in any way by the actor, his management, NBC, Warner Brothers, or any entity associated with production of The West Wing. All pages of this website copyright by MartinSheen.Net.